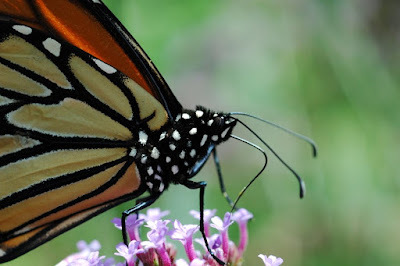 Today I share a Monarch that was the grand finale for me of my day at Cantigny, though not for my blog posts as I still have more to share. This butterfly let me get so close to it. It was so engrossed in drinking nectar I was able to get right up by it's face. Either that or it is hoping for a career as a model. Either way, enjoy! Thanks for stopping by and I hope you enjoyed the Monarch butterfly. Loved the Monarch photo. When I have more time I'll look around a bit more here. 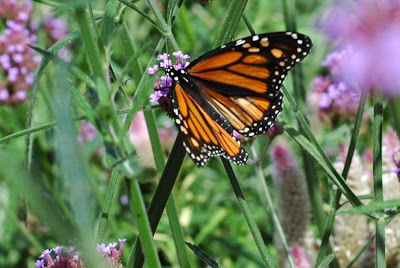 I spent 3 months tagging Monarchs and carrying along my camera to take photos back in 2004. One day soon I'll post some of those photos on my blog. Oh wow, that is amazing that you were able to get so close. I never have that kind of luck with butterflies and she is so beautiful. Thanks both of you. This butterfly seemed to not mind me at all. All the insects that day were so focused on the flowers I was able to get in close. Randy - you should post some of your Monarch photos.